at 8:00 AM Posted by Kelly. It's been one year since we moved to Seoul! 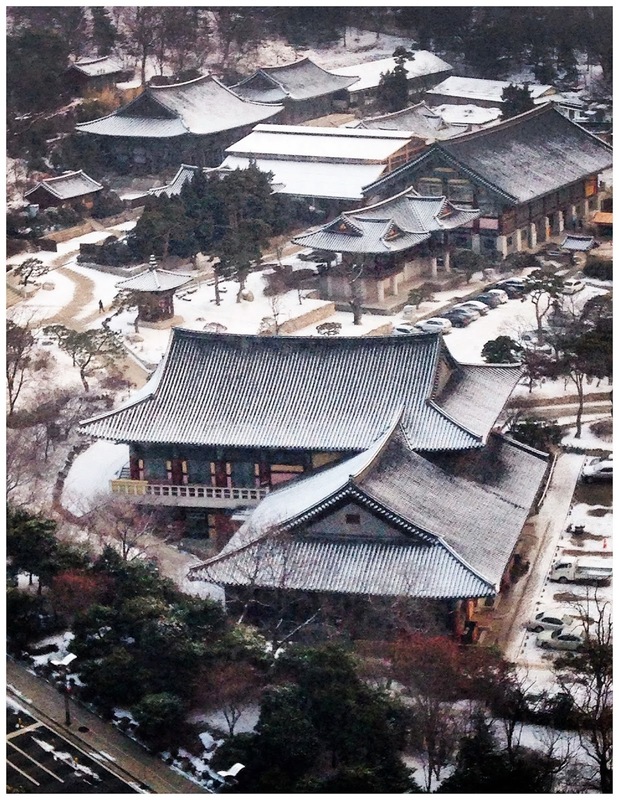 Korea has proven to be beautiful, humbling. wonderful and illogical - all at the same time. With the good and the bad, I never get tired of seeing the Buddha outside our window. at 8:30 PM Posted by Kelly. 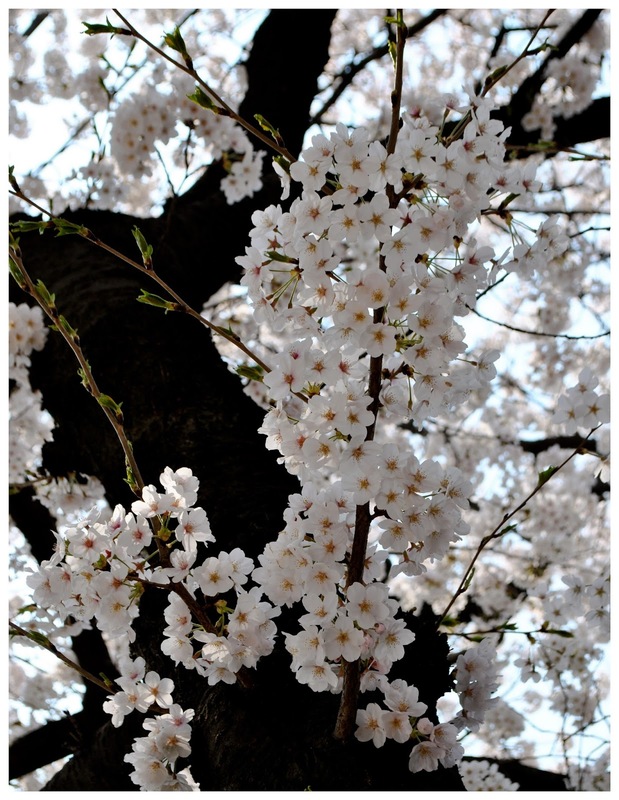 Spring is here, and the cherry trees are in full bloom. They line my walk to work, and surround the Buddha at our neighborhood temple. 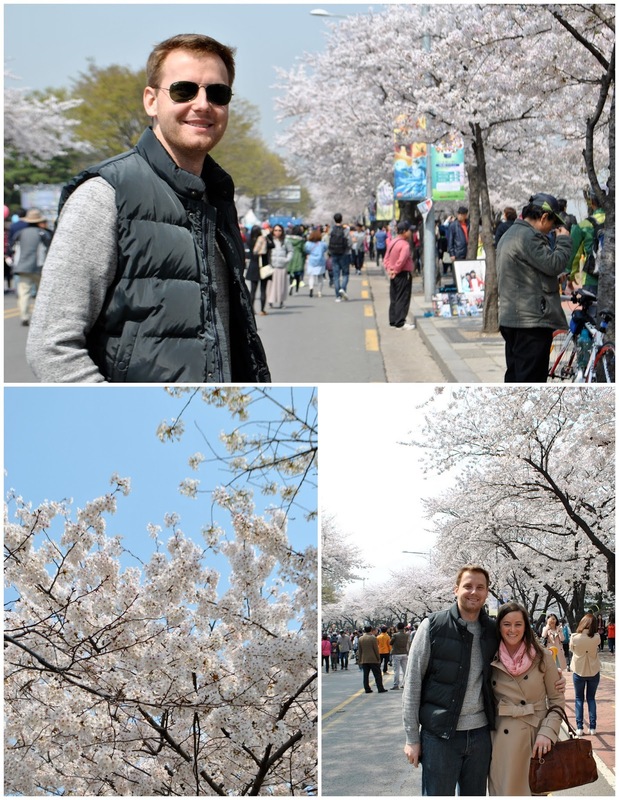 We went to the Yeouido Cherry Blossom Festival to get the full Sakura (사쿠라) experience. While it was beautiful, the "experience" was more the staggering human to blossom ratio. We lasted about 30 minutes before throwing in the towel...and going to brunch. at 12:44 AM Posted by Kelly. While nothing will ever compare to digging my car out of the Michigan snow each morning, Seoul still gets cold. Windy, grey and cold. Since utilities are quite expensive, we spent a lot of the winter in sweatshirts, making a serious dent in our Netflix queue. But we also took advantage of Seoul's indoor activities and escaped to Malaysia and India. I started the holiday season by making multiple trips to the Indian embassy in the snow, while Andrew was working in sunny Australia. This is how I felt about it. I tried to order a green Christmas tree, and realized I don't know the Korean words for colors when I opened the box containing our almost-neon-white Christmas tree. 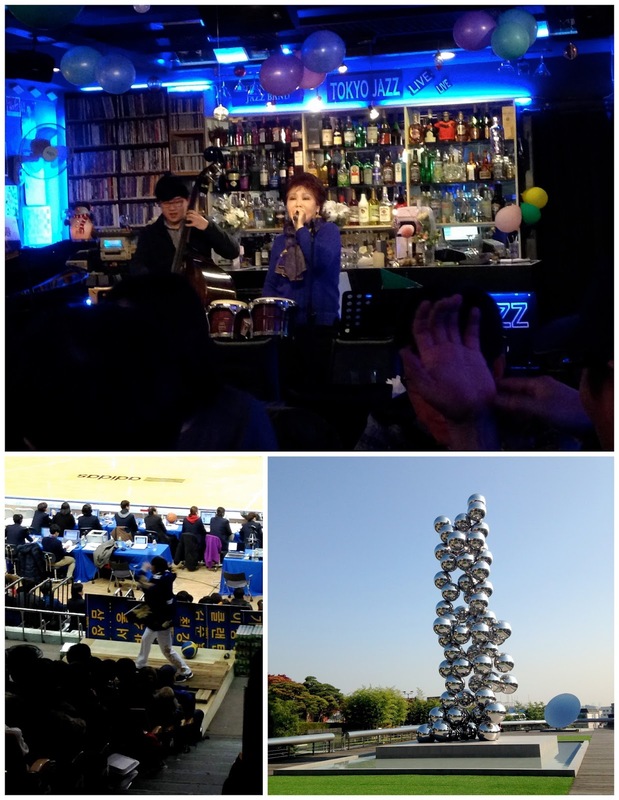 As part of their office holiday party, the Samsung GSG employees/spouses can sign up to give speeches in Korean to win prizes. Since the thought of giving a PowerPoint presentation in Korean is terrifying, my language class learned several Christmas carols. We performed the songs for the office in what felt remarkably like a kindergarten Christmas show. 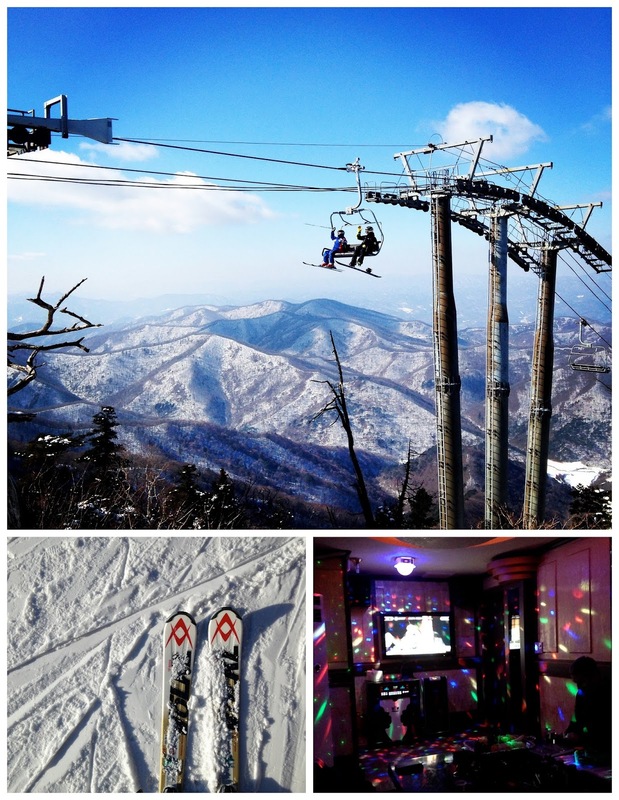 We went skiing in Pyeonchang, host city of the 2018 Winter Olympics! We had a great weekend, and enjoyed comparing the differences from a ski weekend in the States. For instance, bowing is a common respectful greeting in Korea (and East Asia in general). It's normal for someone providing you a service to bow as you enter or exit. In this case, the ski lift operator performs a deep bow as your chair reaches the top, as if to say "Welcome to this Mountain Top!" After a day of skiing in the US, you go back to your cabin, drink boozy hot chocolate and play board games. In Korea, you go to karaoke and belt out their random assortment of English 90s songs. 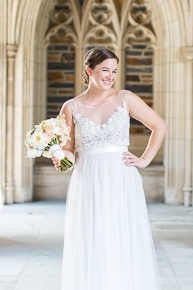 And you quickly realize that "Sweet Caroline" isn't a beloved song on this side of the world. 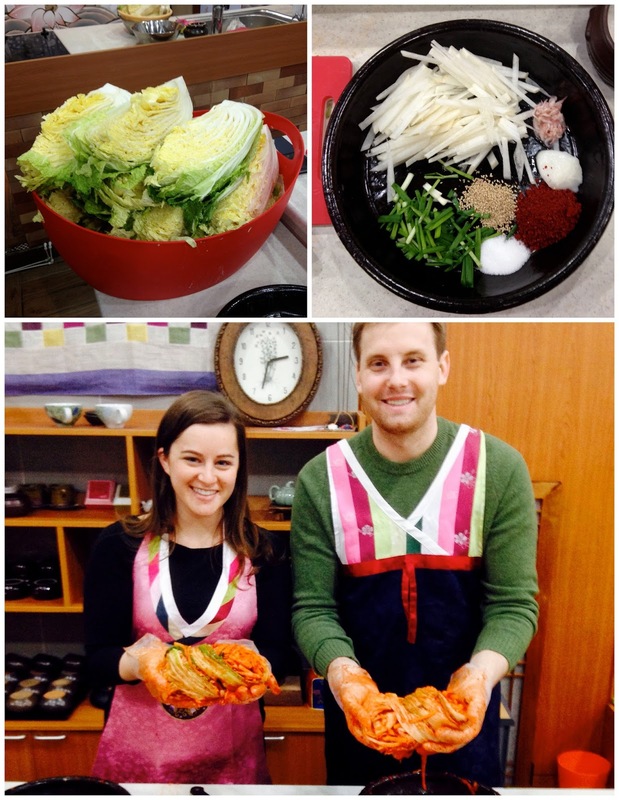 We attended a cooking class, learning to make kimchi and tteokbokki. It was a private lesson, since no one else braved the wind! 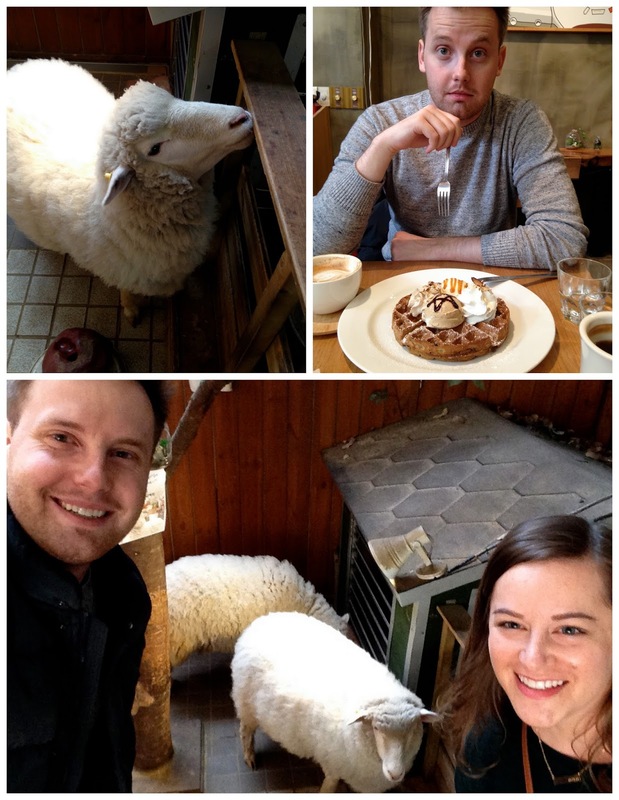 I dragged Andrew to the Sheep Cafe, because it's INSANE to me that a business exists in which you can simulatenously eat waffles and be near livestock named after Disney characters. Since Andrew was working out of town for Thanksgiving, we defrosted the meal I'd made for the original holiday and had a belated celebration on a random Wednesday in March. 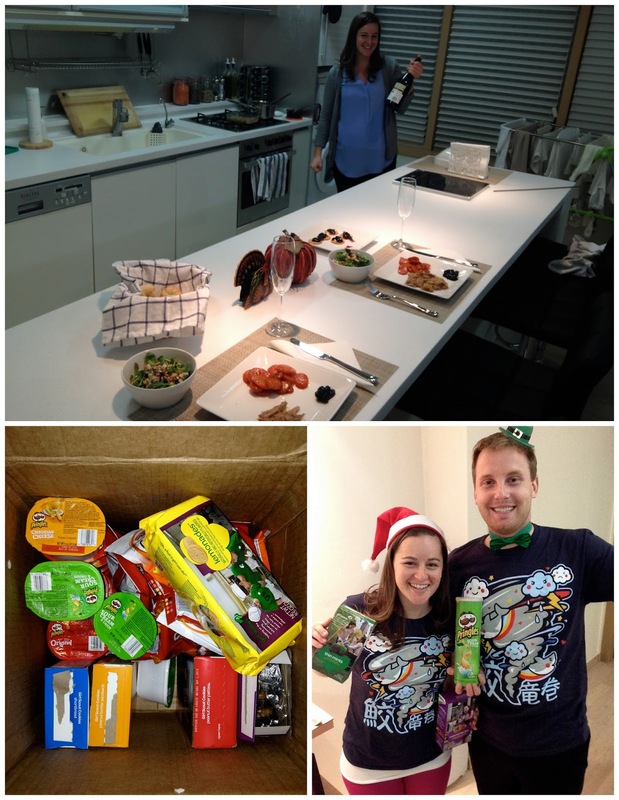 Coincidentally, it was also the day we got two huge care packages of American snack foods, belated Christmas presents, early birthday presents and Girl Scout cookies! (Fakesgiving was full of gluttony, so it was very much like real Thanksgiving). 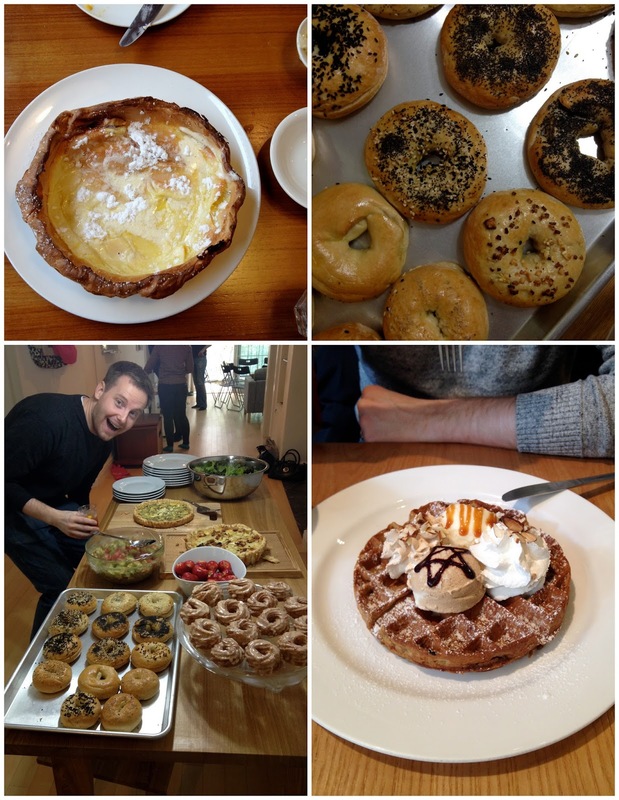 …and we ate a lot of brunch. at 7:40 PM Posted by Kelly. As you may know, last week was the Lunar New Year. We spent the holiday traveling, but we're celebrating a little late by eating the traditional Korean rice cake soup, called tteokguk (떡국). Tteok is a type of rice cake, and guk means soup. You eat this soup on New Year's morning to bring good fortune for the coming year, and to signify becoming a year older. The saying goes "In order to get one year older, you must eat your tteokguk". Since age is very important in determining status in Korea, so is tteokguk! Once you finish eating your tteokguk, you are officially one year older. A traditional way of asking someone's age is "떡국얼마나 먹었어요?”, or "How many bowls of tteokguk have you eaten?" Korean age is a bit different than Western age. Where as Western age is calculated by birthdays, Korean age is calculated by years. Koreans count the time from conception to birth as a child's first year, meaning that when a child is born they are already 1 year old. Then, everyone's age changes on the Lunar New Year, not on their individual birthday. So, a child is born as 1 year old, and then becomes 2 years old on their first Lunar New Year (regardless of how soon before the New Year they were born). I am used to eating black eye peas and collard greens for New Year's luck. You won't be surprised to learn I couldn't find either of those things in Korea, so I'm making sure we get our good fortune the local way. In case you want to embrace the Korean New Year, and add a year to your arsenal, make this soup to welcome the Year of the Sheep! Adapted from "Healthy & Fresh Korean Kitchen"
1. Soak the tteok slices in cold water for 30 minutes, then drain. 2. Combine broth, soy sauce, sesame oil and chili oil in a stock pot, and bring to a boil. Add salt and pepper to taste. 3. Separate the egg white from the yolk. Gently beat each until smooth. Lightly oil a skillet, and place over medium heat. Pour the yolk into a thin layer and fry into a crepe. Repeat with the egg white. Remove from heat, slice into thin strips and set aside. 3. Once the broth is boiling, add the rice cake slices, reduce heat to medium and boil until soft, around 3-7 minutes. 4. Ladle the soup into bowls and top with egg, green onions, garlic and gim. 5. Enjoy! Store the leftovers separately. If the rice cakes are stored in the soup, they will become soggy. *Different regions of Korea use different broth bases. The North normally uses beef broth, where as the South uses oyster or seafood broth. Vegetarians like me, and some parts of central Korea, use vegetable broth. at 6:00 PM Posted by Kelly. I’m a bit behind here, but it’s been a busy winter! 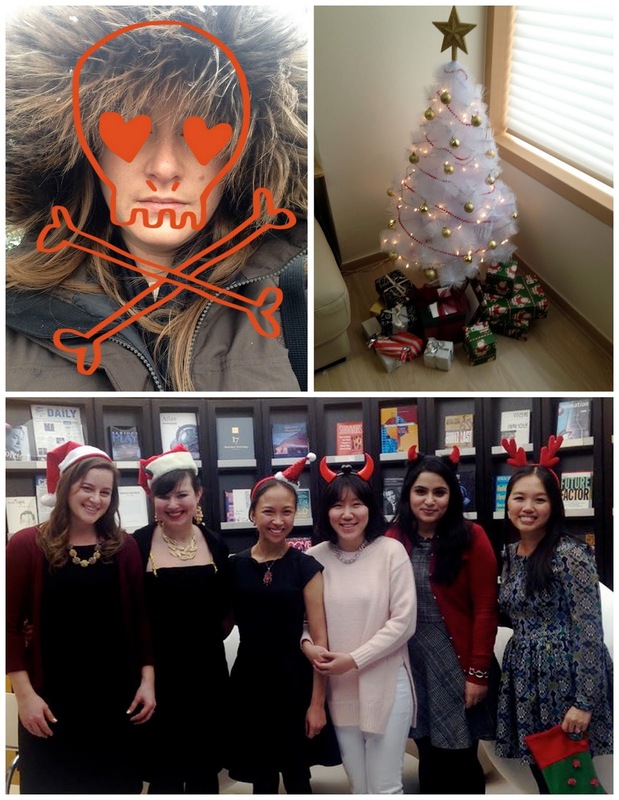 Right before Christmas, I accepted a job with an international environmental organization. After three long and laborious trips to the immigration office, I finally got my employment visa and started working in January. Business is conducted in English, my coworkers are from all around the world, and I love their mission - I'm really enjoying it so far! The only downside is the commute - an hour each way. But it's a direct shot on the subway, and I'm getting a lot of reading in! I have finished 5 books in less than 2 months...which means I'm accepting your book recommendations immediately. at 3:18 AM Posted by Kelly. Since it takes awhile to find all the western ingredients, I started prepping and freezing thanksgiving dishes two months ago. Then, Andrew got called on a last-minute work trip to Australia, meaning our First Thanksgiving will need to be postponed. So, I cooked the turkey that wouldn't fit whole in our freezer, tore it apart, and packed it away for later. Living abroad means having both rewarding and challenging experiences. And while I really like Korea, I felt the first pangs of homesickness today - Thanksgiving. Today especially, I'm missing my family. I miss standing around the island, laughing and trying not to ruin our appetites with the cheese tray. I miss sitting on the back porch with all the cousins, even though the "kid's table" was abolished long ago. I miss the flurry of activity in the kitchen, as everyone works on their tasks. I miss ending the night drinking Irish Coffee out of teacups with my cousin Rachel, sending selfies to our youngest cousin. The good news is that homesickness can be cured with the familiar. In a country without cranberries, I recreated my Uncle's famous cranberry orange sauce...by rehydrating craisins. I packed up my coffee maker (and the necessary transformer) to bring along Irish Coffee to a potluck dinner. I FaceTimed with my family (at 3:00am Korea time). 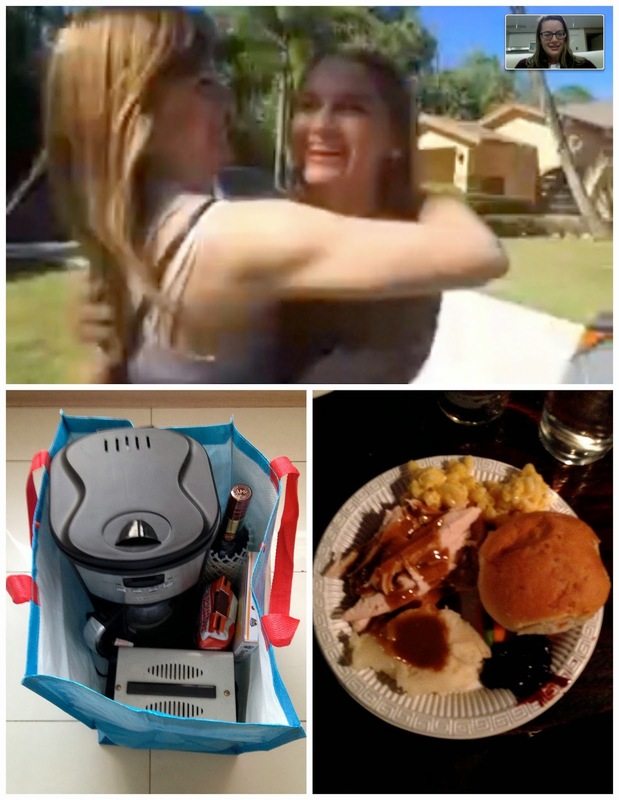 And when Andrew gets back, I'll make him eat a freezer's worth of turkey and gravy. Because in spite of being homesick, I'm so thankful for our friends here, FaceTime, my husband, and potluck dinners. at 3:30 PM Posted by Kelly. 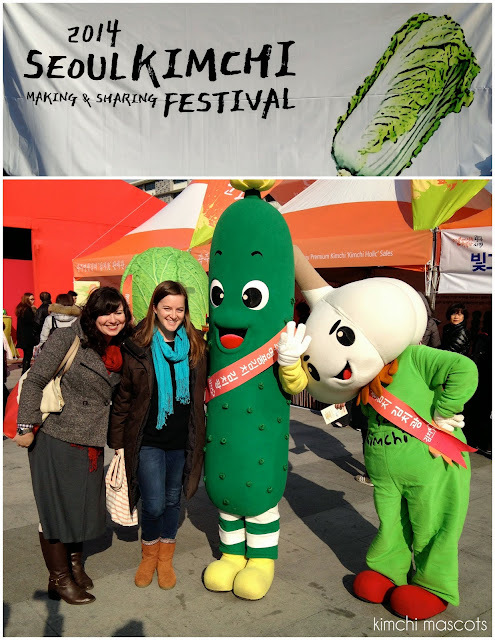 My Korean class went to the Seoul Kimchi Festival. 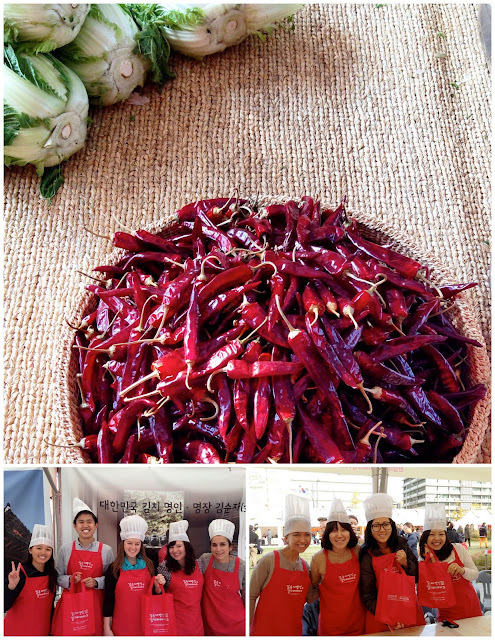 We learned to make traditional cabbage kimchi…which means that our separate kimchi fridge is housing more than just beer these days. at 10:54 PM Posted by Kelly. 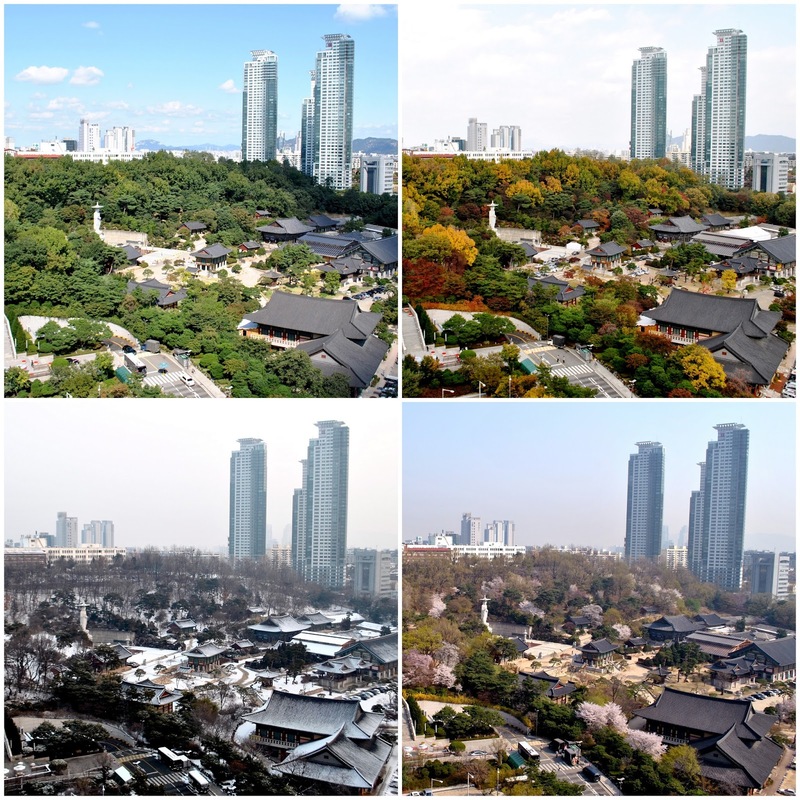 Autumn apparently comes to Korea much later than the US. I was watching a newsfeed of leaves and pumpkins back home when it was still 80 degrees here. But, suddenly the weather and the leaves changed (hooray!). With the cooler weather, it's finally enjoyable to spend weekends outdoors. We went on a street food tour with O'ngo Foods, and tried some new snacks. We started with Jeon (전), a savory Korean pancake often filled with vegetables, seafood or kimchi. The food stall was in an underground market, filled with locals. 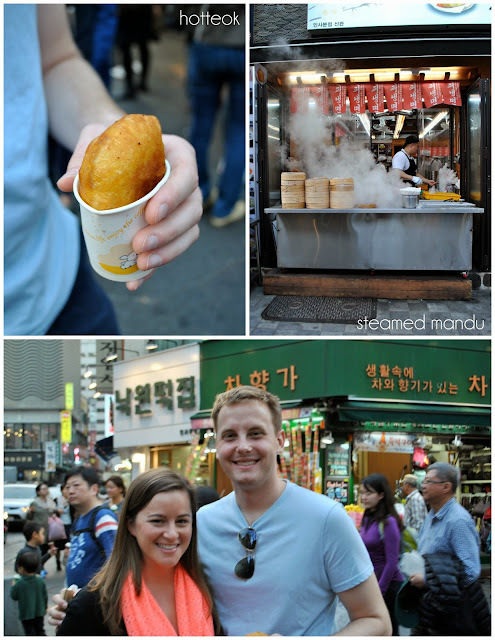 Then, we headed for the ever-addicting Mandu (만두), better known as steamed dumplings. 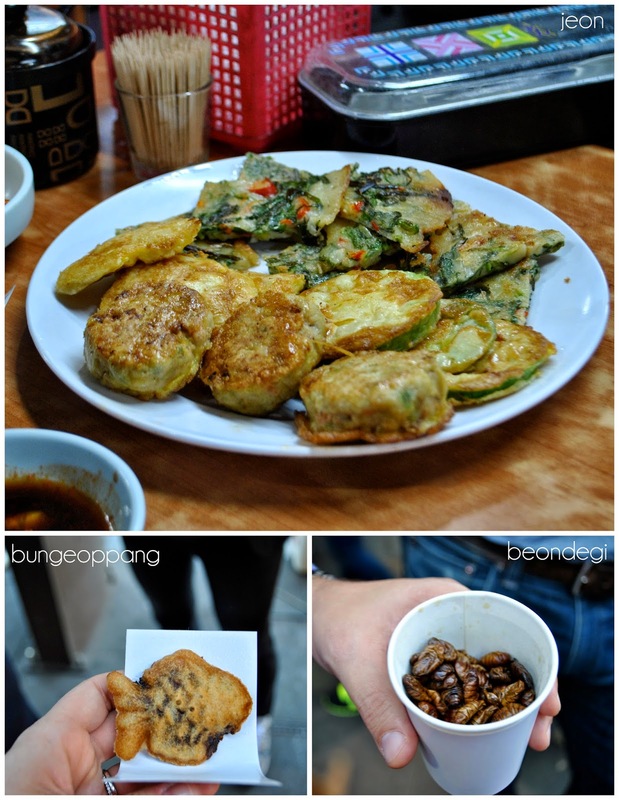 The strangest thing we tried was Beondegi (번데기), silk worm pupae. They were very crunchy, and tasted almost like edamame with sesame oil. It wasn't bad, but it's not a dish we're planning on having regularly. We had a three course dessert, starting with Bungeoppang (붕어빵), a pancake filled with sweet red bean, shaped like a fish. These are very common, and come in many different styles - including some shaped like chrysanthemums…and others shaped like poop. (Yes, you read that right.) We also tried Ppopgi (뽑기), a children's favorite, which is essentially hardened burnt sugar. Finally, we ate Hotteok (호떡), a sweet pancake stuffed with brown sugar which best resembles a sugar doughnut. Overall, a very tasty afternoon! 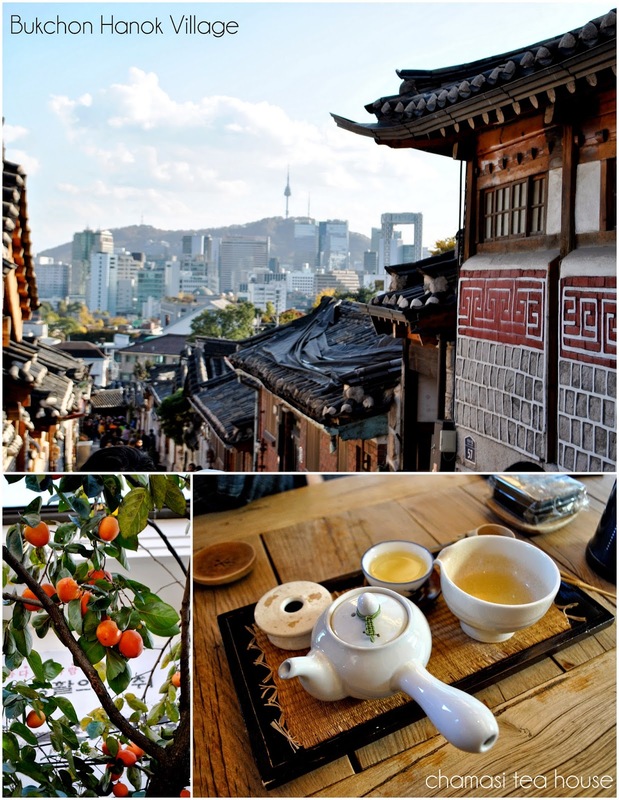 We spent last weekend exploring Bukchon Hanok Village, a residential area of traditional hanoks. 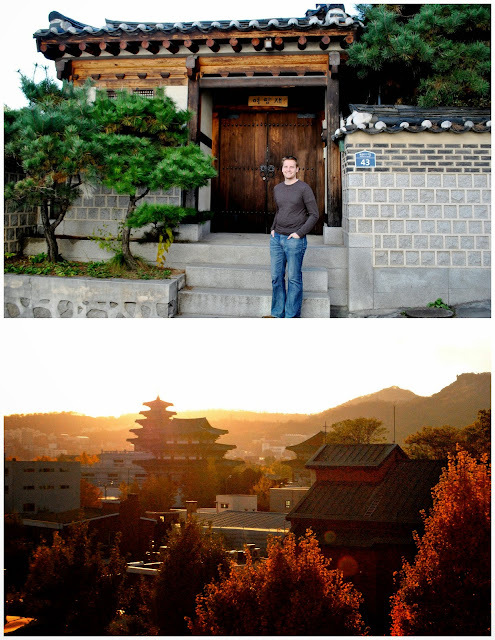 I imagine every expat in Korea dreams of living in a hanok before they move here. Impractical, and far from the office - but way cool. 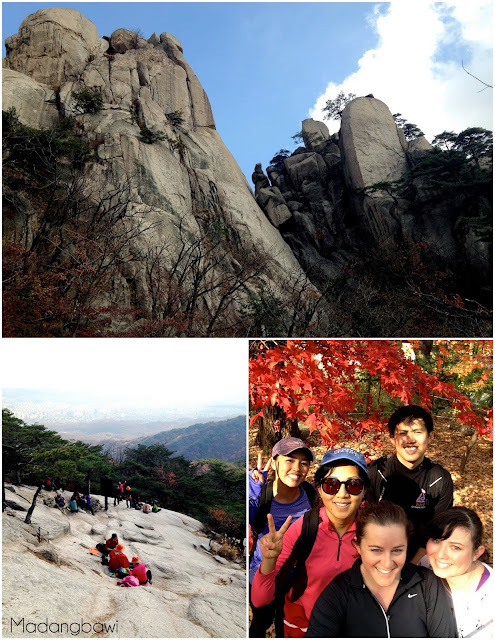 With Fall in full swing, some of the partners and I hiked up Mt. Dobongsan. 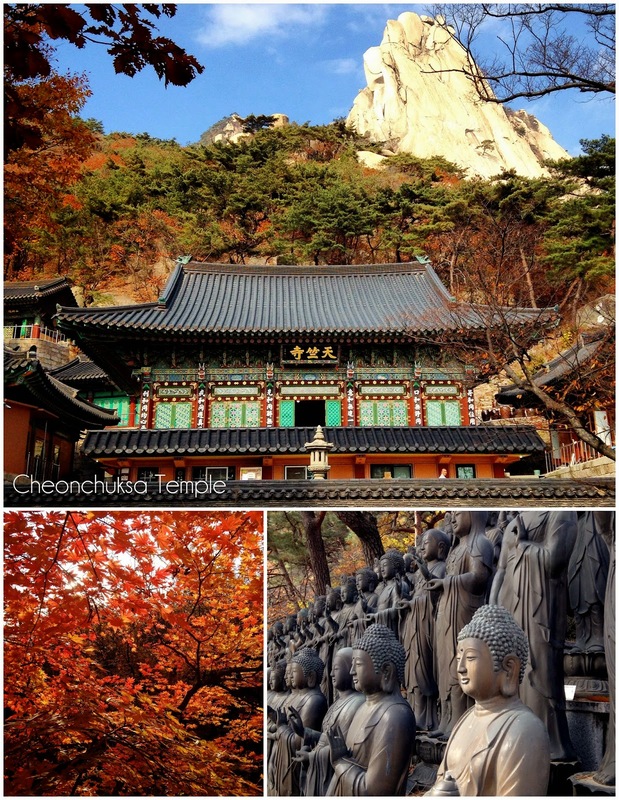 It was a beautiful, moderate hike up to Cheonchuksa temple. We decided to keep going up to the summit, which turned out to be the opposite of moderate. We were legitimately using our hands to climb up the rocky path. 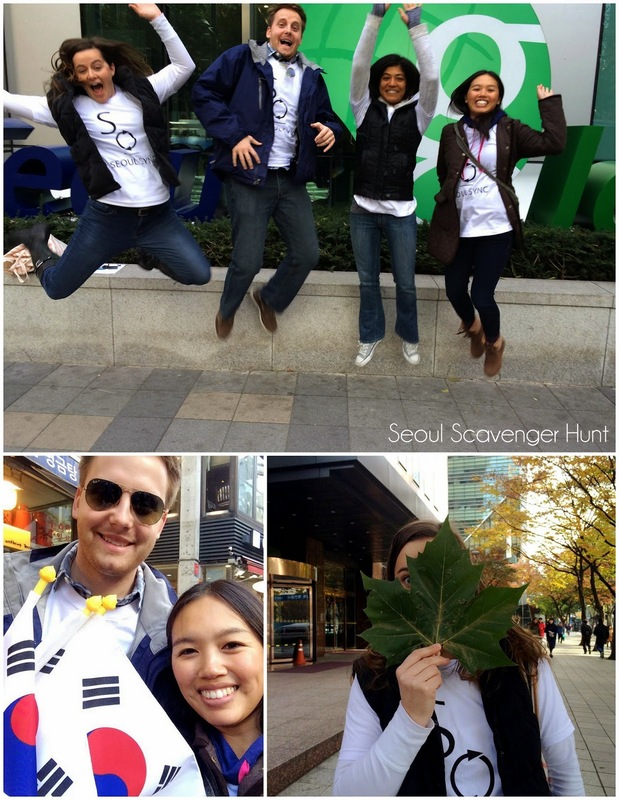 But, we had some good leaf peeping and some (cloudy) views of the Seoul skyline! But the big news: our stuff is here!! Our boxes arrived safe and sound, via the Panama Canal. We shipped our bed, kitchen items, clothes and the TV. We brought over one pot and one skillet in our suitcases (sorry, TSA) so you can imagine my delight at having a working kitchen again…and more than two pairs of pants. at 7:28 PM Posted by Kelly. Korea is extremely proud of their alphabet, called hangul. And they should be. It's a very efficient system that is easy to learn and read. (That's where the ease of the Korean language ends, I'm afraid.) While other writing systems developed over time, taking on various inconsistencies and pronunciations, hangul was created in the 1400s by design. Korea is so proud of their alphabet, they have a holiday for it - Hangul Day. 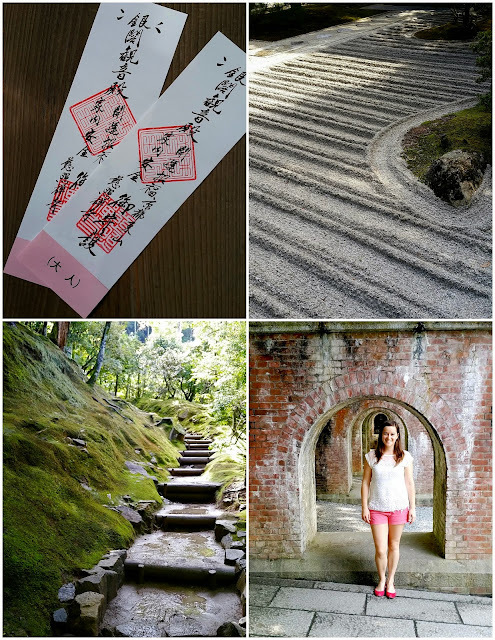 To celebrate this momentous holiday weekend of alphabet…we took a trip to Japan! 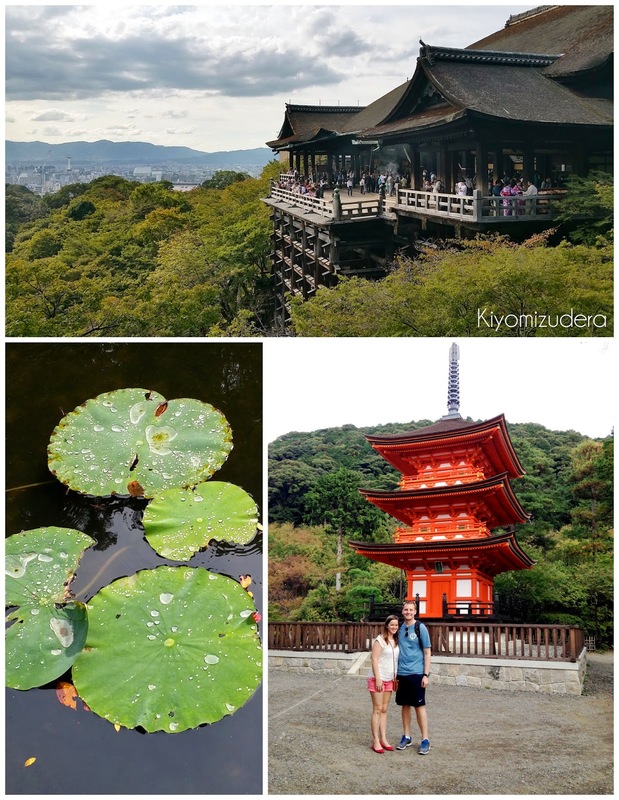 Our first stop was Kyoto. 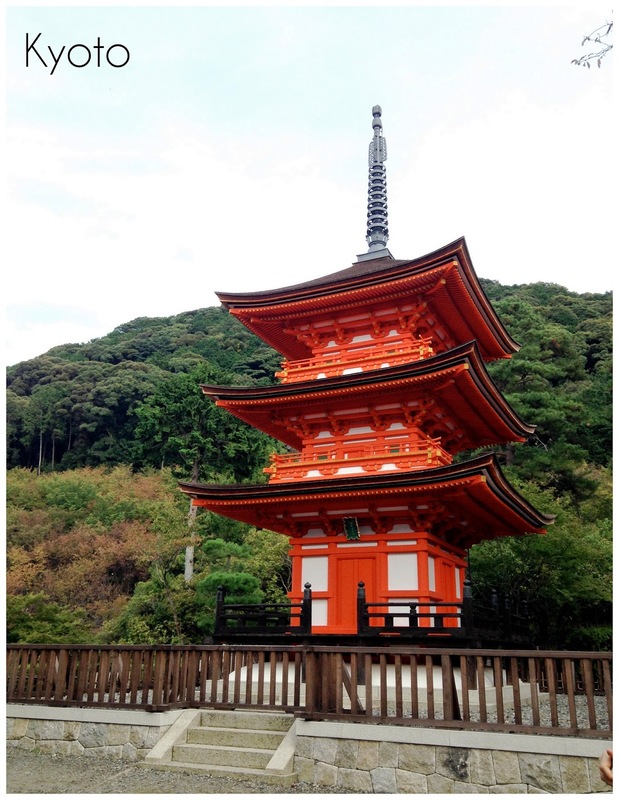 It was an absolutely beautiful city; the temples live up to the hype. 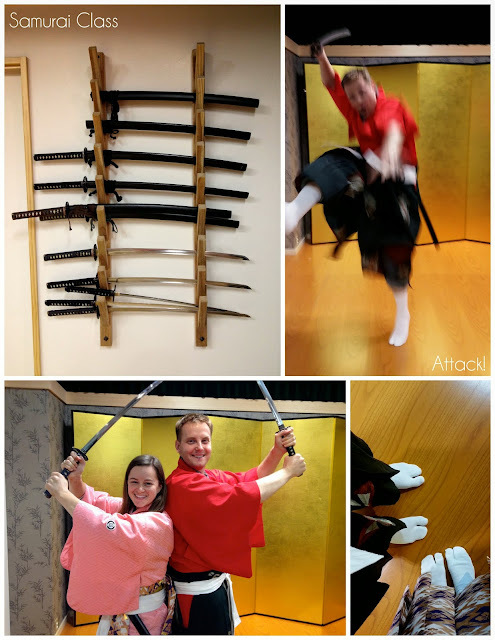 Plus, we took a samurai class, complete with toe socks! We had heard only great things about Kyoto, and Japan has been in my top 3 "must see" countries for years. We did more planning for this trip than we have done in a long time. And so much of it went wrong. Our flight was delayed. The amazing Google Map we'd made wouldn't open. The address of the noodle bar was wrong. I cracked a raw egg into my rice, thinking they'd served me a cooked egg. Credit cards are not accepted, even at the airport, and we tried 8 ATMs before we found one that would accept a foreign bank card (Oh thank heaven for 7-11!) The recommended breakfast area was closed. We spent an hour going out of our way to find that the sushi place was closed. The biggest temple was a mob scene. We missed three consecutive trains, because it left from another platform. We walked in the complete opposite direction of where we needed to be, ending up in a suburban apartment area. The final temple of the day was closed, and the sun setting, by the time we got to it. When we were finally on the correct train, it sat at the station so long we decided to call it quits…and the train started moving just as we were trying to exit. So we stood there, whizzing towards a destination 30 minutes away, and just laughed. Because despite all the planning, and mapping out of best routes, and saving restaurant addresses in two languages: traveling is an adventure. And sometimes adventures go wrong. All you can do is laugh...and buy a rush ticket to Osaka. 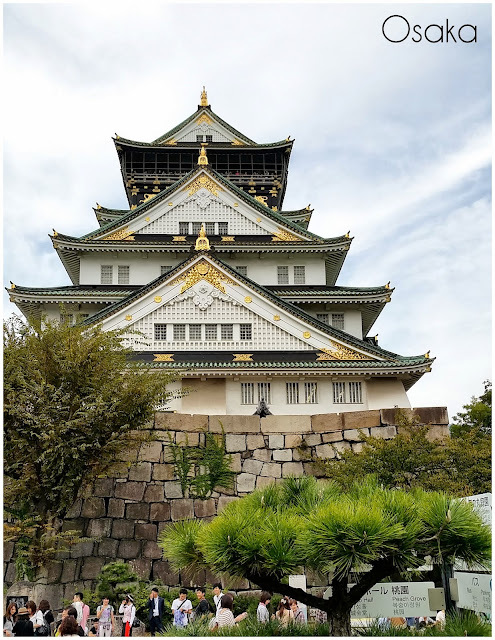 Osaka often gets a bad rap. 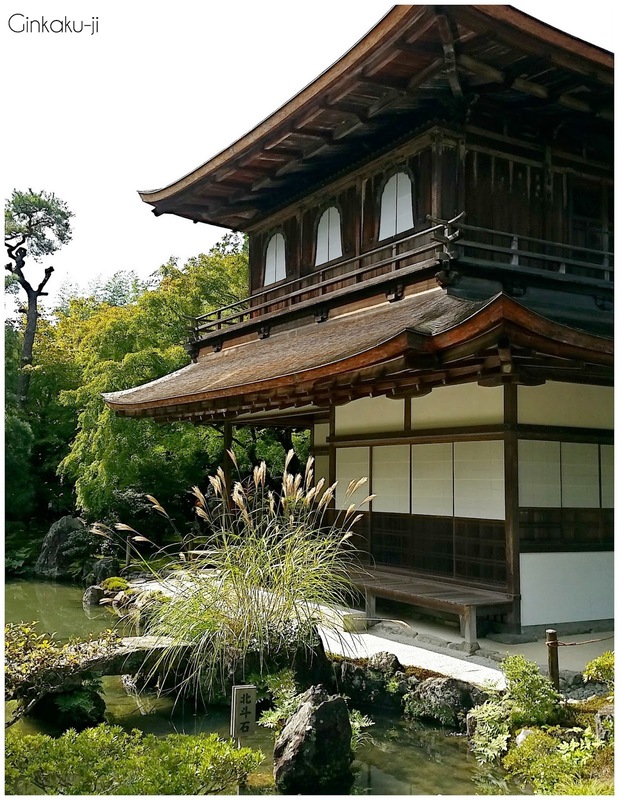 As the second biggest city in Japan, it seems to get overshadowed by Tokyo. But we had a great time, and ate our body weight in amazing food! 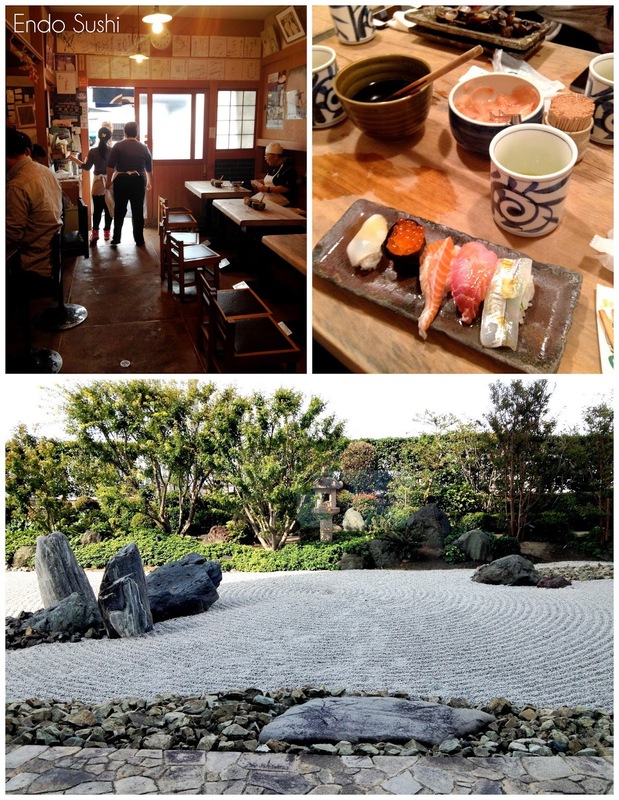 We waited in line for an hour to get in to the tiny Endo Sushi, but it was incredible and absolutely worth it. We ate yakiniku kobe beef. [I try not to eat meat, but made an exception for the world famous beef and it was heaven.] 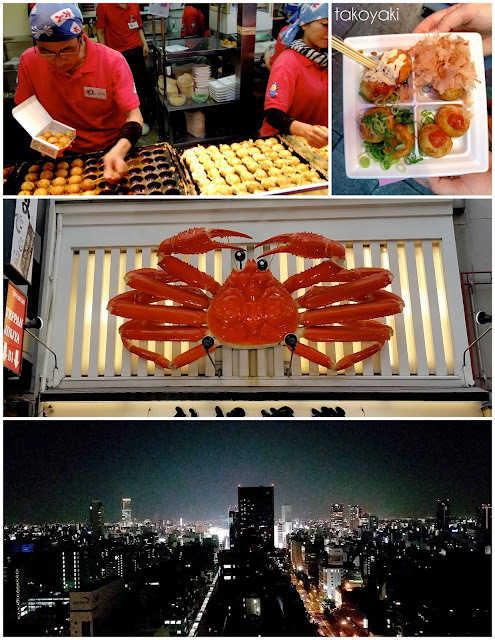 Plus, I found my new favorite street food: octopus takoyaki. We toured Osaka Castle, found a five-story Sega arcade and fell in love with Green Tea KitKats. Until next time, Japan! at 9:59 AM Posted by Kelly. Andrew started work Tuesday! He's off at a five day orientation, a couple hours outside Seoul. When I woke up the first morning without him, it started to feel real. "I live in Korea." But, by the afternoon, the feeling had passed. 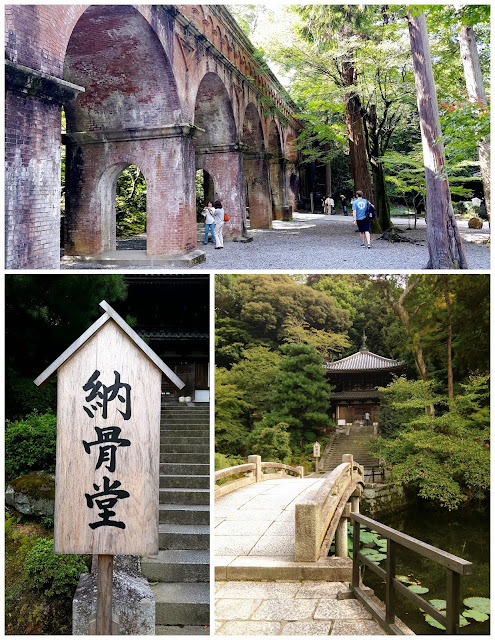 With so many errands to run, very little furniture, and lots of exploration - it still feels like a long vacation. Maybe when our stuff finally crosses the ocean it will feel real? While Andrew has been gone, I've done errands and looked for jobs. But mainly, I've been exploring around town. I met some of the other "better halves" [in Business School, we were called "partners"; here, we're called "better halves." Who can argue with that, really?] for lunch at Plant, a vegan place in Itaewon. I cannot tell you how happy I was to see food made of fresh vegetables! Korea loves their pickled vegetables and meat. 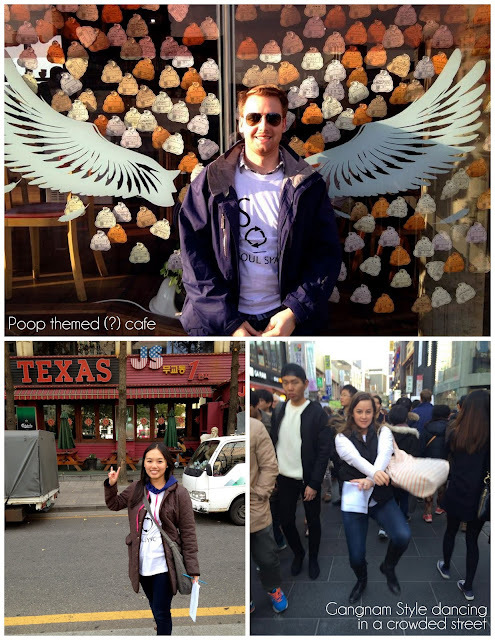 We walked around the antique street of Bogwang-ro, where everything is way cool…and way expensive. I left coveting all of the amazing card catalogs. On the way home, we stopped at the foreign food mart to buy some hard-to-find things (lentils, chickpeas, nuts, hooray!). 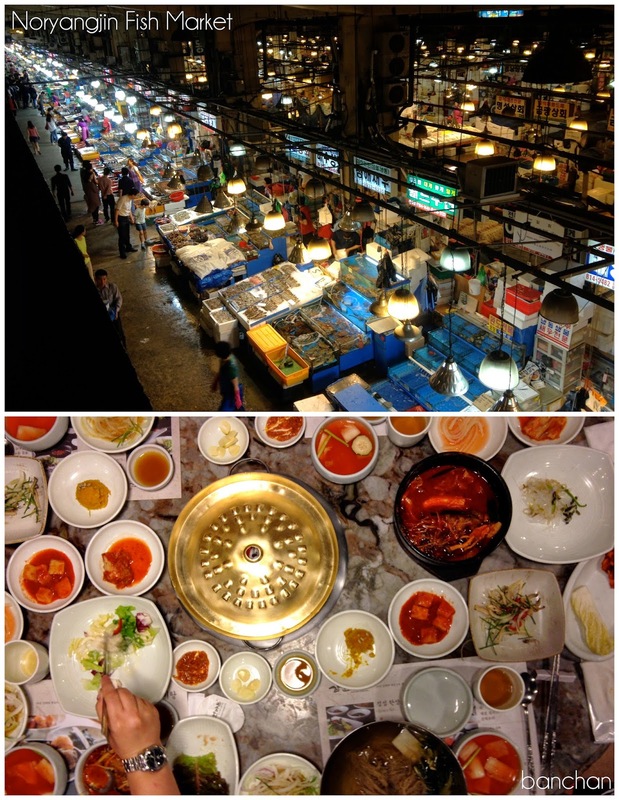 I met up with Ashley for a sushi date at the Noryangjin Fish Market. Since we were there late, the fresh fish auction stalls were closed, but there were plenty of stalls open selling fish from tanks. In theory, you purchase a fish or crab, and bring it to a restaurant upstairs. 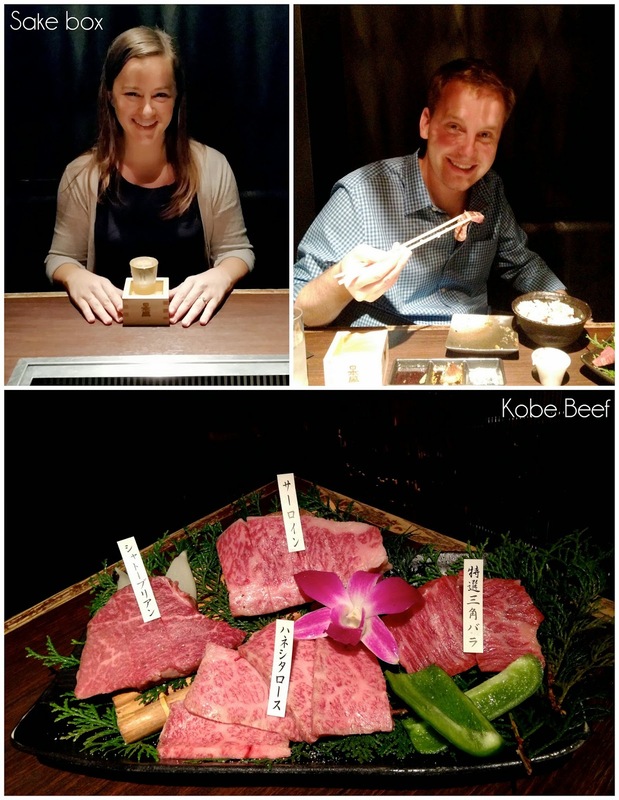 For a fee (like a corkage fee), the restaurant will cook it, or cut it and serve you sashimi. We didn't BYOFish, so we just ordered from their menu. 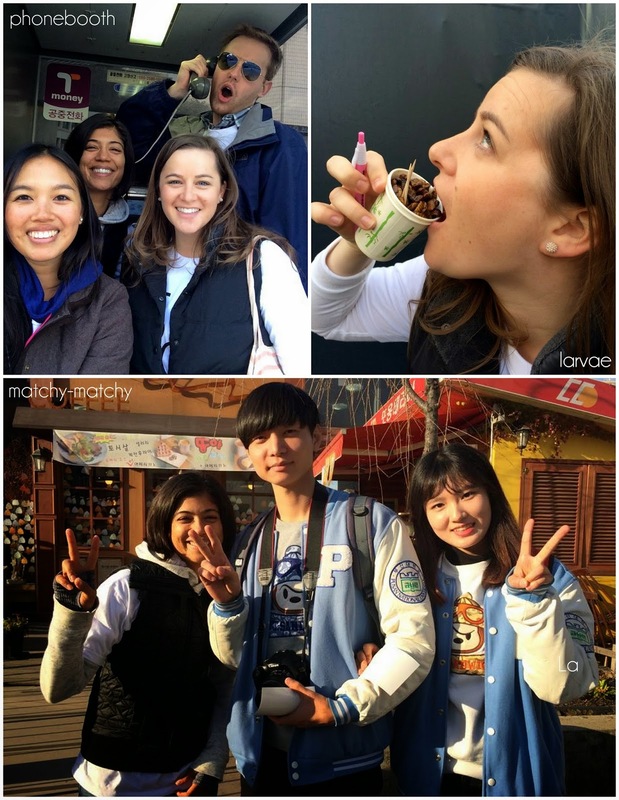 A group of us also explored the Yangjae Flower Market. I have never seen so many orchids! But my real goal of the trip was achieved when we found herbs! I already miss my container garden from Michigan. Fresh herbs are hard to find in Korea, and when you can - they are expensive. As an example, I saw three basil leaves for sale at the grocery for 3,000₩ ($3.00). 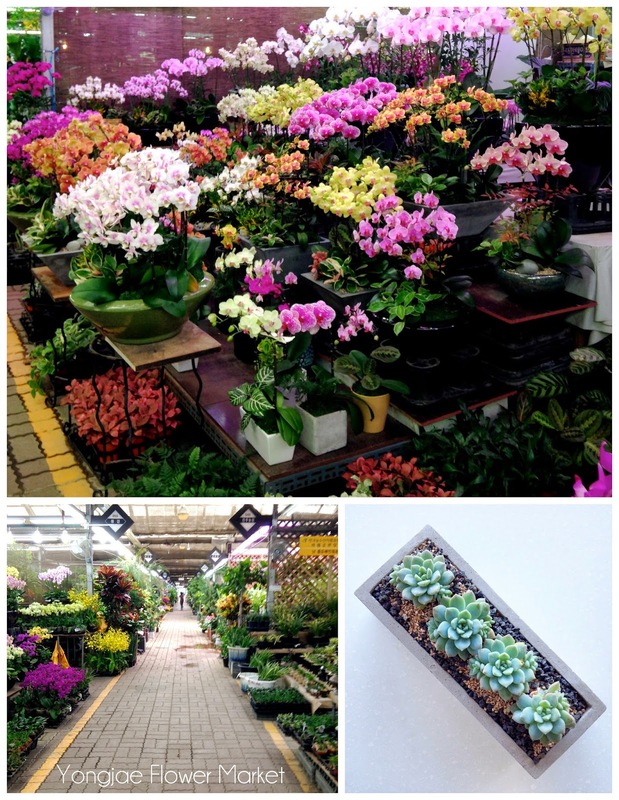 So, you can imagine my delight at finding 2,000₩ plants. Most of our apartment faces north (not ideal growing light), but fingers crossed I can find them a spot. My big adventure this week: getting my hair cut! I looked up Korean words to describe what I wanted before I went. Once there, I exhausted my Korean within 45 seconds. 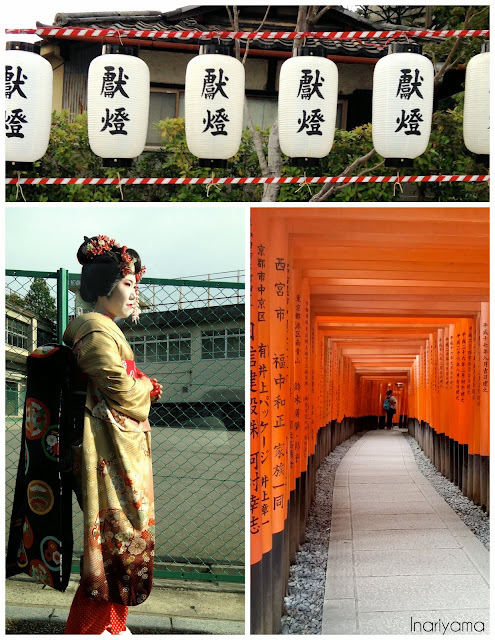 It wasn't hard to find someone who spoke English, but there were definite language barriers. For instance, when I asked for 7 centimeters cut off, she thought I wanted 7 layers. [FYI Males, or people without layers: 7 layers is mullet territory.] Once that was cleared up, my haircut was interrupted multiple times by stylists coming over to feel and remark on how thin my hair is. But it was easy to forgive them, because the second set of interruptions was calling people over to look at my "very blue lovely eyes." All in all, I left with shorter hair, so it was a success! I ended the week out to dinner with a couple friends. Korean food is served with multiple types of side dishes, called banchan. So many plates on one table!